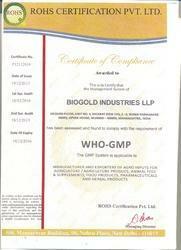 We, “Biogold Industries LLP” are an ISO 9001:2008, ISO 22000:2005 and OHSAS 18001:2007 certified organization, established in the year 2013, engaged in manufacturing, supplying and exporting Agro Products. Under this commendable range, we are offering our clients with Biscuits Products, Organic Liquid Fertilizers and Filter Cigarettes. 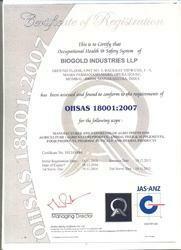 Our organization is a Partnership firm Registered under limited liability partnership act, 2008. The range offered by us is known for its features like longer shelf life, rich taste and purity. Owing to these features, our offered range is demanded across the global market. Backed by state-of-the-art infrastructure facility at our premises, which is segregated into different departments, we are able to carry out the production process with perfection. To handle these departments, we have hired a team of diligent professionals. Our experts leave no stone unturned to process the entire range as per the requirements of customers. With the support of vast distribution network, we are able to dispatch our range on-time to the customers’ premises. Catering to the specific demands of customers in efficient manner, we have mustered our position across Sultanate of Oman, Republic Of Iran, UAE, Ghana, Yemen and United Kingdom. We are exporting our product in all over the world. Under the leadership and guidance of our mentor ‘Mr. Pradeep Bhatia’, we have grown at remarkable pace. His in-depth knowledge, experience, expertise and never ending efforts have increased our credibility across the national and international markets. Agro Products, Organic fertilizers and Manure, Milk Growth Promoter, Biscuits. Our Vision is to be one of India's best Bio Technology Enterprise of Global Distinction. Our Mission is to serve the farming community with the highest grade of inputs for sustainable agriculture. Intellectual asset creation to constantly innovate new crop care products through intensive research and development. Build business partnerships and customer relationship by providing outstanding products, services and long term and mutually beneficial associations. Human capital development through research, training, mentoring, empowering personnel and developing healthy work culture for better performance. 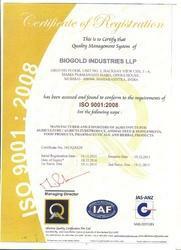 We at Biogold, are committed for total quality, reliability, long term relationships and excellence in all our products and services to the level of customer satisfaction and delight. Thus, we endeavor to accomplish set goals of the organization with continual improvements. Our scientists and technical staff ensure the highest quality & consistency of our products. 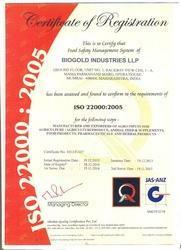 At each stage of manufacturing the quality standards are checked at each stage of manufacturing process. Final Agro Products are thereafter certified by independent Organic Certification Agencies like Ecocert India, and Vedic Organic. At Biogold, we believe that being environmentally responsible is part of our job, The Group focuses on manufacture of Eco-freindly and economically viable crop care solutions to fulfill the current needs without compromising the welfare of the future generations. We are committed to developing sustainable agri-business practices with strong quality consciousness, business ethics and sincere aim to serve the agri-industry and the farmers. We believe in making changes in consonance with scientific advancement, and strive continuously to improve our products our facilities and our processes with a total commitment to environmental conservation. We offer only Certified Organic Agro Inputs and offer the farming community total replacements for chemical fertilizers like DAP, MOP, SOP, TSP, CAN. All our products are Organic, Bio degradable and free of toxins, they leave no residues on cash crops, vegetables, fruits and Horticulture produce. Our products offer sustainable agriculture and are totally environmental friendly.